Anyone who knows me knows that I LOVE ice cream. I love ice cream shops, soda shops and old diners. Always have! When it came time to build a new permanent set I knew exactly what I wanted to do. It was just a matter of collecting pieces and designing the right space in the studio. I knew what colors I wanted and had a clear vision of how I wanted the space to feel. When I found the perfect bar stools about 5 months ago I began rapidly collecting other bits and pieces for the design. I met model Nichole Moore a couple of months ago when we were working on a project for a publication that will be out in November. She was really excited to come test out the new set for me. 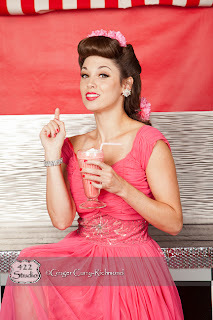 I did her hair and makeup and the dress she is wearing is one of the studio's dresses that I found on a vintage clothing shopping trip (sorry I can't remember which on it was at) So without further adieu I bring you the 422 Studio "Malt Shop" set. Restrictions apply so be sure to read them before you book your date. * Not Valid weekends or Labor Day. * Offer valid with Malt Shop set only. * Price does not include prints or 5% VA sales tax. Thank you Rainey! I've been wanting to do this one for a long time.